Many people switched to the Apple iPad Mini, leading many to believe that the bigger version will already be pulled out of Apple's line-up. Apple officials would like to reiterate that this is not spot-on because it will actually be redesigned and launched third quarter this year. According to the market research company, TrendForce, Apple will overhaul its popular device and is said to possibly capture consumer interest again. The design will be improved and will possibly be thinner than it is today because the company plans to use the panel used with the iPad Mini. Also, the company will retire the iPad 2 with the announcement of a revamped 9-in iPad. It remains to be seen whether or not Apple will decrease the price for the new iPad because of the narrow panel, but it is a welcome thought to many who cringe at the price of Apple products compared to other brands of equally-capable or better devices. Although Samsung is currently the leader in device shipments last year and the first quarter of this year, its nearest competitor, Apple, is not so far behind. In fact, it has posted strong sales on the iPhone 5 and the iPad Mini, despite lower demands on its newest iPhone. The Cupertino Company shipped a total of 20.3% of its devices in the last quarter of 2012, whereas Samsung reportedly shipped 21.2%. The increase in the shipment was attributed to the introduction of the iPhone 5 and the iPad Mini, which are still selling quite well at present. These figures will surely set new records when the Samsung Galaxy S IV has also been launched and sold in the market. The Korean Company is making sure that their shipment percentage will take a big leap once their flagship phone starts selling in the market. Jimmy Kimmel's show likes to humor the ordinary user's ignorance from time to time and show it for everyone to see. Just like the show did last year when the iPhone 5 was unveiled - asking people on the street if they like the new iPhone when they actually got to try an iPhone 4. 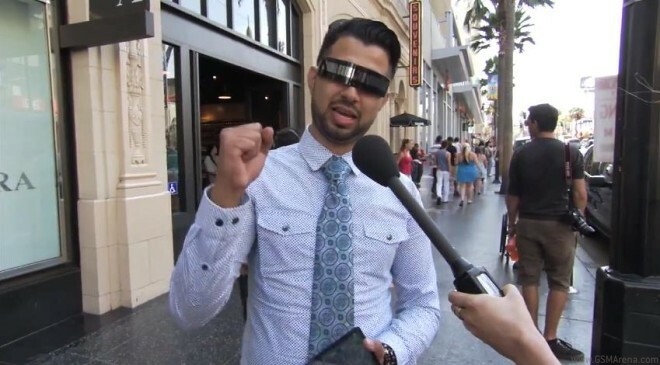 This year Jimmy Kimmel's show decided to step things up and inquired people how they feel about the iPhone 5s while handing them an, wait for it, iPad mini. If these people really are random people off of the street, and not paid actors, we can understand not being aware of what would set apart the new iPhone from the last, but to believe that an iPad mini is an iPhone takes a special kind of ignorance about technology. 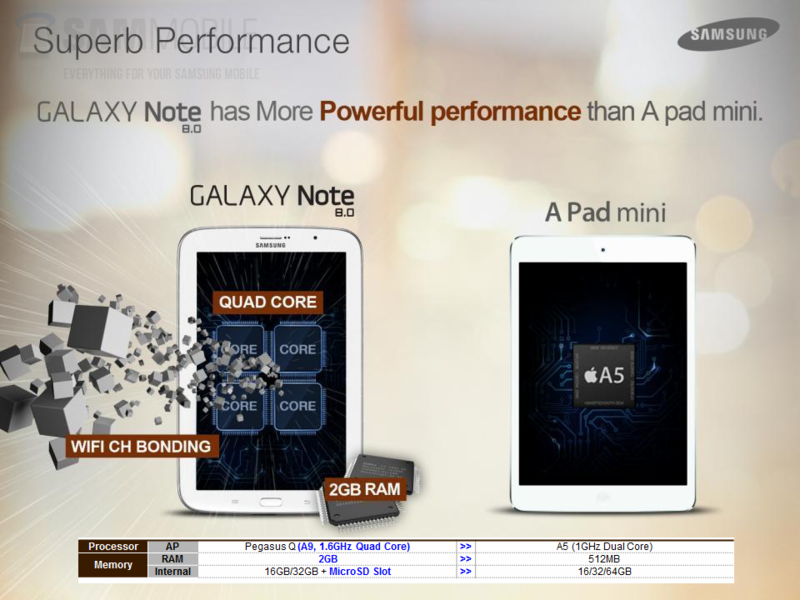 From GLBenchmark database, it seems like Samsung will likely to be releasing a version called Samsung Note 8. 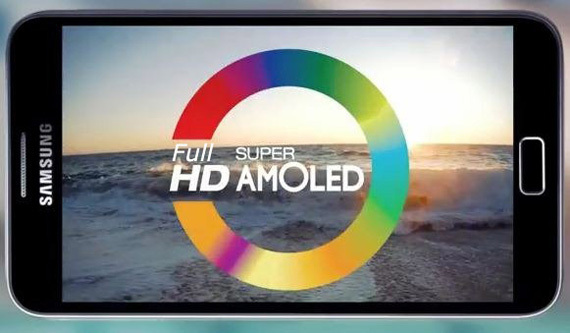 Specs including an 8-inch Super Clear display and a resolution of 1280×800 pixels. It will run Android 4.2 Jelly Bean OS and feature 2GB RAM, HSPA+ support, Wi-Fi, Bluetooth, A-GPS, 5MP and 1.3MP cameras, 16 or 32GB internal memory, microSD card slot and of course, the same S Pen just like the other Galaxy Note models. So how well the purported Galaxy Note 8.0 would do against the iPad mini will come down to price. Unfortunately, that's one piece of info that did not leak to SamMobile, so we'll just have to wait to find out how aggressively Samsung would price the tablet. $249 would be a possibility? Samsung and Apple have always been in a tight race to smart devices supremacy and each has attracted droves of following all over the world. Each company will take a swipe at each other whenever they can and it's interesting and definitely most entertaining. The latest? Samsung thinks Note 8.0 is better than the iPad Mini because of several reasons. According to the Korean giant, the Note 8.0 is waaaay better because it has a quad processor, is capable of multi-tasking, and has a stylish stylus! (Cheer!) It even went out of its way to create a poster for the jab aimed at the Apple A Pad Mini. It's also possible that they were talking about a different brand of device. Kidding aside, Samsung has really topped its performance with high-profile devices and innovative technologies. It is so successful that even Google is already taking notice of its important niche in the Android market. With that said, here's hoping they'll hire a new publicist or a marketing manager who has better grammar next time. A new tablet is coming up at Samsung's camp but it's not the 10.1-inch Full HD AMOLED device that it was originally planning to follow up S 4's release. Instead, an 8-in AMOLED tablet will most likely be launched in response to the iPad Mini and another 7-incher, the Google Nexus 7. According to the source, this tablet will have a Full HD display at 1920 x 1200 pixels and is to be announced in IFA 2013 in Berlin. Samsung has delayed the bigger tablet to probably concentrate on the upcoming Note III and not let Apple and Google get away with the 7-inch market. It could also be the fact that Samsung is still developing the revolutionary AMOLED that self-adjusts according to the lighting condition and user comfort. A few more months to go and we'll already see these next exciting Samsung products. Paul Semenza, an analyst at DisplaySearch, has surmised in an interview that to beat the iPad Mini to the market, the second generation Nexus 7 may be unveiled even before Apple's higher-resolution device will be launched. The iPad Mini Retina will possibly be introduced on the third or fourth quarter and will have similar resolution as the iPad 3 and 4. The present iPad is not as smooth as other contemporaries in the market. The Retina technology will double the iPad Mini's pixel density and will really improve the quality of display. Semenza also mentions potential suppliers for the iPad Mini's display. He didn't mention any for the Nexus 7 but the device will similarly feature a richer display than the last generation. It might also feature HD technology as smaller tablets are somehow going in the same direction as the bigger tablets' display were improved markedly.